Crime Scene is a 148-page quarterly magazine delving into the world of water-cooler crime drama on TV, film and in fiction. Covering the hottest crime drama, like Sherlock, True Detective, Fargo and The Bridge, and the latest novels from best-selling crime authors like Ian Rankin and James Ellroy. 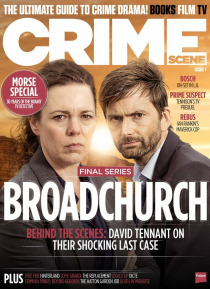 Crime Scene is packed with previews, interviews and features, on set-reports, reviews and series over… views. It brings the expertise, access and craft of Total Film and SFX to focus on the biggest and most popular genre of TV drama and of fiction: Crime.